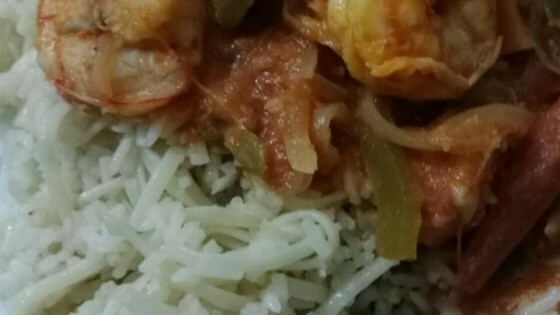 "These prawns are delicious served over a bed of rice and black beans." Place butter into a medium size pot over a low heat; let melt. Add the onion, garlic and bell peppers to the pan, saute until just tender. While the vegetables are cooking, combine the tomato paste with the warm water; stir. Pour the tomato-water mixture into the pot of vegetables and bring the mixture to a boil over a low heat. Stir and season with salt and pepper to taste. When the pot comes to a boil, add the prawns. Let the prawns cook until they are pink. Forgot to cut back the tomato paste/water combo, so it was a little too much tomato. My own error. Otherwise very good!